Today Oak Island Fishing Charters went back to Carolina Beach were we have been wearing the Spanish Mackerel and Sharks out. The only problem was today the big body of fish were gone and the weather was perfect so this goes to show fish have tails. We started searching and found schools of fish along the way as we kept picking at them. Good news is looks like the fish are getting closer to home. Well see what happens later. Today Oak Island Fishing Charters squeezed in 3 very successful trips. The first was all the Spanish Mackerel you want to catch and big sharks. The second trip was a very nice catch of 2-4 pound flounders. The last trip was catching Sharks and catching is what we did. 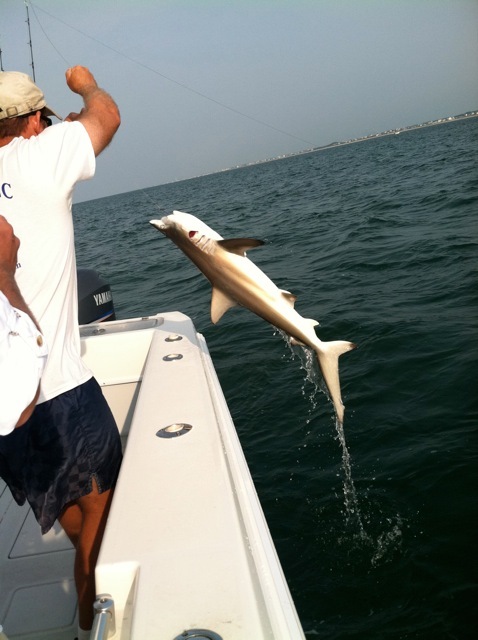 Once again Oak Island Fishing Charters went the extra mile to catch fish. Today was not as good as yesterday but that’s not saying much since yesterday was the best Ive seen on a nearshore trip in a while. Both trips caught good to great numbers of spanish and 80-100lb blacktips. Not to mention the ocean is rough off Oak Island and we were fishing in calm water. Looks like one more long trip in the A.M. then fishing for flounder in the afternoon. Today had to be the best day of the year to run nearshore trips. The first trip we found the fish in Calm water a put whopping on them till the 30 min torrential rain hit us. Even though the rain slowed us down we were all smiles. The second trip beat the fish up pretty bad. With sunny skies and calm winds we caught 60 Spanish in less than an hour then we went to catching 100lb blacktips. It has been a long time since Ive seen so many Spanish jumping all I can say is you would have been there to see it. 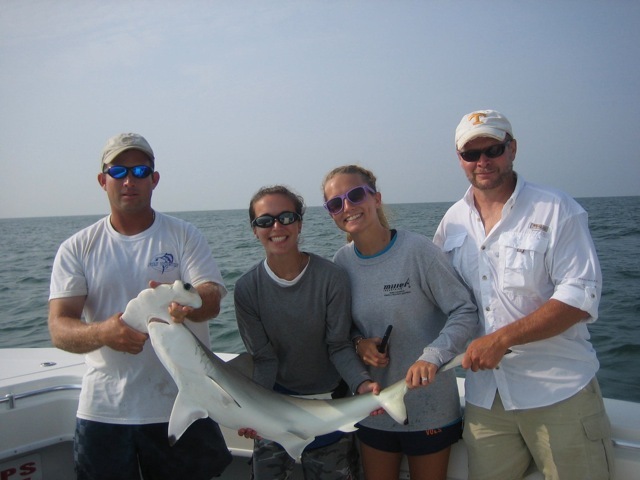 The first nearshore trip was tough this morning just like yesterday, we saw plenty of sharks behind the Shrimp boat but could only manage one good one. I moved the second trip to the evening and went to a calm spot where the fish was stacked up. We landed 8 nice sharks and lost a Blacktip that put on a show for us by jumping out of the water over and over. Looking at the Heat, Wind and over all tough fishing on my end I might ride out the next few days till the weather gets right again. Today Oak Island Fishing Charters started out looking for Spanish Mackerel but they were few and far between. So with time left we started Shark Fishing and it did not take long before we had a big one jumping around and broke our wire. We finally landed several nice blacktips then headed to the house. Finally I have some Shark Pictures from a couple charters last week. Since my camera does not like saltwater I am depending on the charters for pictures. As they come in (or I have time I will post). Oak Island Fishing Charters did really good today on both Nearshore fishing trips. The Spanish Mackerel were the fish of choice today. Hopefully the rest of the week will stay steady. Oak Island Fishing Charters had a 1/2 day trip this morning looking for Sharks. First thing we need was some fresh Spanish Mackerel and that did not take long. Once we put the lines in we were catching Sharks. We caught several nice Blacktips and a Hammerhead.